Poker 5 Card Draw – game rules. FAQ – see how to play Poker 5 Card Draw on GameDesire! 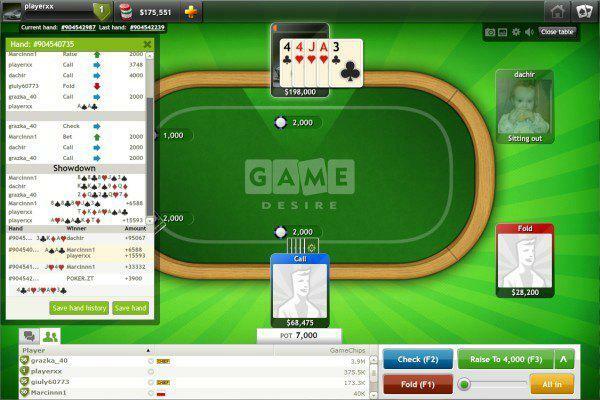 When players are sitting by the table, first thing is to choose a Dealer. 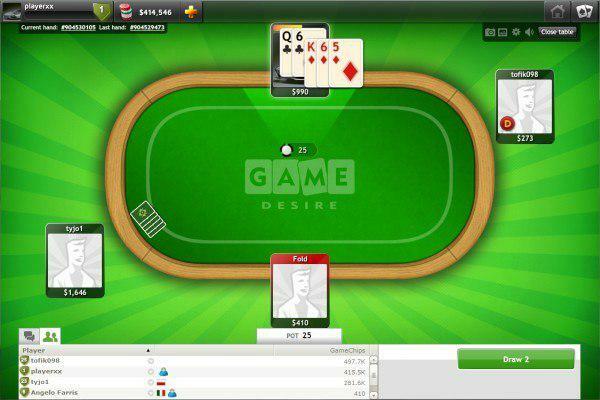 Players are dealt one card and highest card determines who will be the first Dealer. This person is marked with special "D" emblem. Once the hand is over, the Dealer emblem and responsibility is moved clockwise around the table to next person. 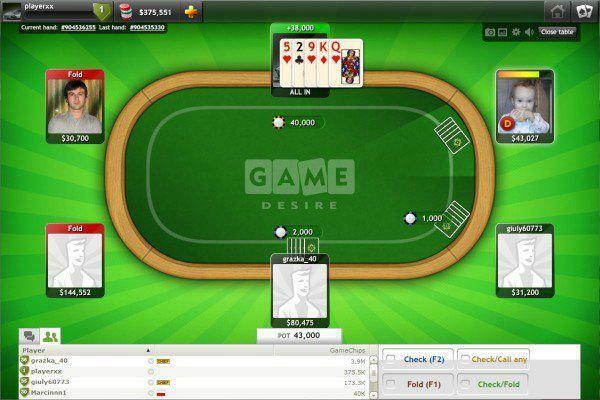 In online poker all of the dealing is made automatically by the software. Before cards are dealt to one or more players, forced bets are taken. The Buy-in could be called the ante. The buy-in/Ante is the sum of GameChips taken from all players sitting at the table or blinds - small and big blind (double blind) taken from two next players sitting after the dealer. If table is for 2 players, there is no Small/Big blind, the amount of entry is just equal to two times ante. How important is position at table? The player after located clockwise from the player who posted the Big blind starts the betting. He is in early position, sometimes called "under the gun", because he must be the first person to act. Dealer and players in late position have a big advantage against other players. When their turn to bet comes, they will have a lot more information about the current hand (like the number of opponents still playing this hand or and how the ones still playing are betting. 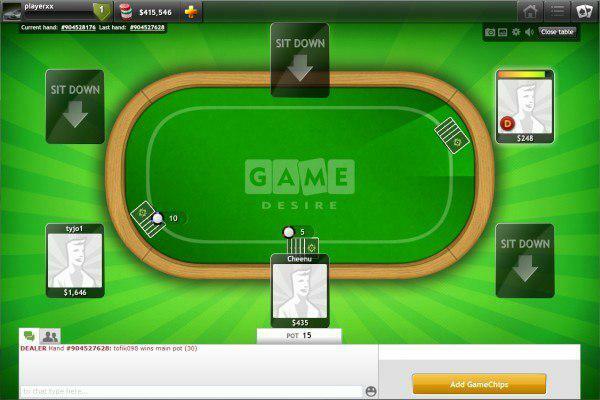 If there are no bets in the current betting round, a player can check for free. This means not putting in any new GameChips into the pot. Game continues, and the player is still in the hand. I want play in tournament – what should I know? Event - is a tournament which does have a pre-assigned start time. Sattelite - is a tournament in which the prize is an entry into a larger tournament and have a pre-assigned start time. You can sort tournaments in Tournaments Lobby in any way. On right side you have Tournament Details with important information about each tournament (e.g. type, costs of buyin/rebuy, prize pool or players limit). If you want more information you can click „View” button. 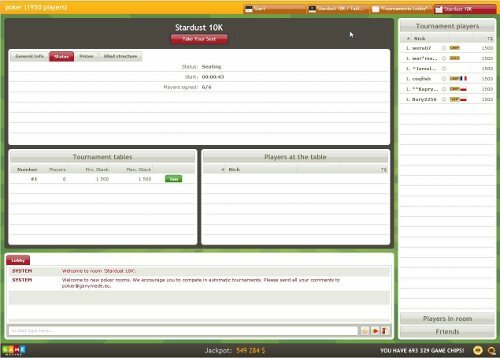 At start players will be randomly assigned to places at table – we can take it up by clicking „Have Your Seat” button. 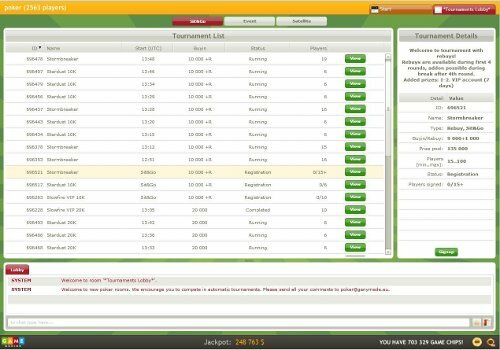 In the same time you can watch general info about tournament, status, prizes and blind structure. Blind structure is very important because you can see what blinds will be at each rounds and when you can make rebuy (it's possibility to add virtual cash in game for special price avalible at Buyin/Rebuy box). Person who buy the most additional chips is a „Rebuy king” which is characterized by a crown icon at nick. Stack is amount of chips you have in front of you. On tournament tables we can see minimal and maximal stack at the moment. Game disconnected – what can I do? When your game break down you can back again without any losts in about one minute. Our system works like „Sit out” option. Can I see game history? All hands played on the computer are saved in special files (Gamedesire folder in My Documents).